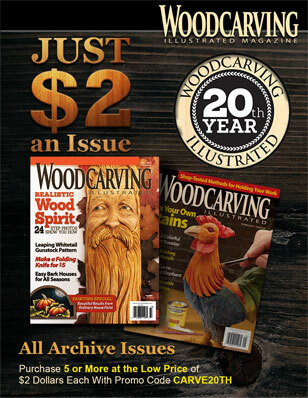 This article originally appeared in Woodcarving Illustrated Spring 2006 (Issue 34). 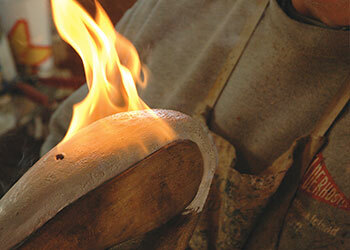 Bob Swain spends days carving an intricate dragon from 10 separate pieces of white cedar. Finally, with the pieces assembled, the form takes shape. The head is high and alert, the body curves in a graceful arc, the wings and crest sweep back as though the dragon is moving at great speed. 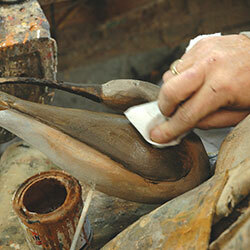 Bob turns the piece from side to side, and reaches for a well-worn paintbrush. 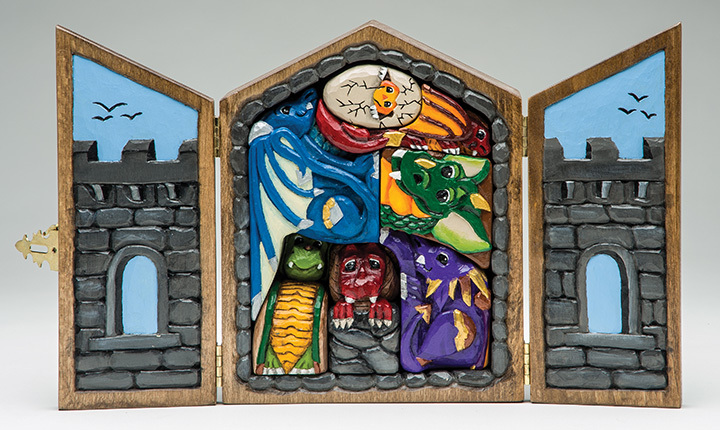 He soaks the brush in dirty mineral spirits, douses the carving, lights a wooden kitchen match, and in seconds the dragon is ablaze. 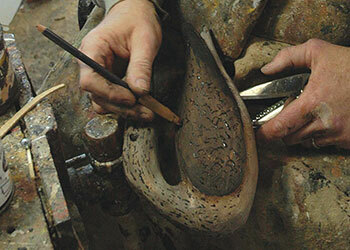 It is something of a miracle that Bob sculpts wood at all. 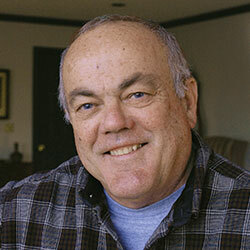 In 1965 he was a college student majoring in business. He and some friends were heading off on a weekend trip one rainy Friday night, when the car went out of control and struck a culvert, and Bob’s spine was snapped. 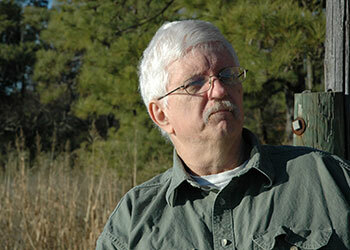 Barely out of his teens, Bob faced months of rehabilitation and a future in a wheelchair. However, the accident seemed to kindle some latent spark of independence in Bob. Rather than giving in to the physical limitation, he uses it as motivation. He completed rehab, moved back home, and began running the family’s farm supply business, expanding it to include greenhouses, ornamental plants, and garden tools. 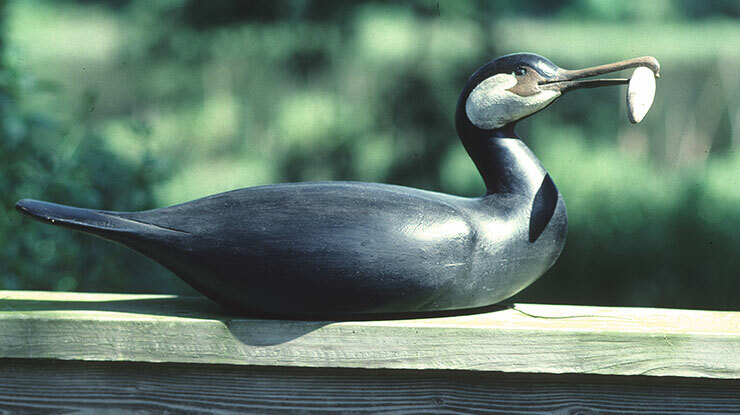 Bob lives on Hunting Creek on Virginia’s Eastern Shore near the Chesapeake Bay. 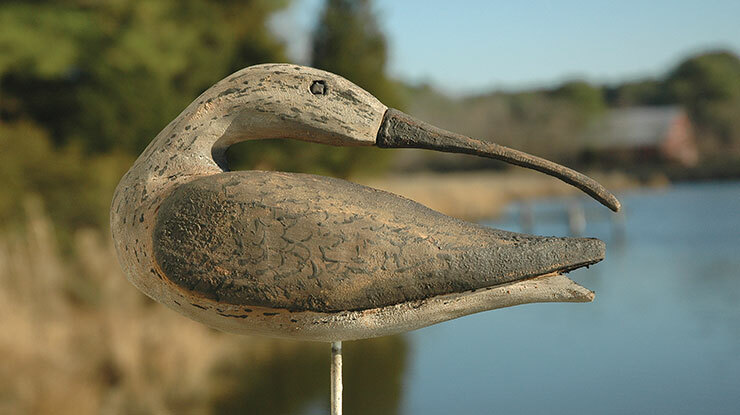 He began carving 20 years ago when he began collecting antique hunting decoys. 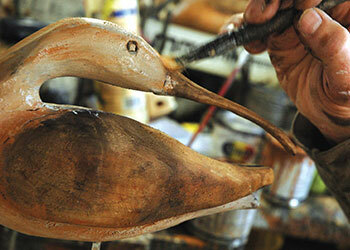 Bob enjoys the weathered patina of old decoys, and attempts to replicate it in modern carvings. 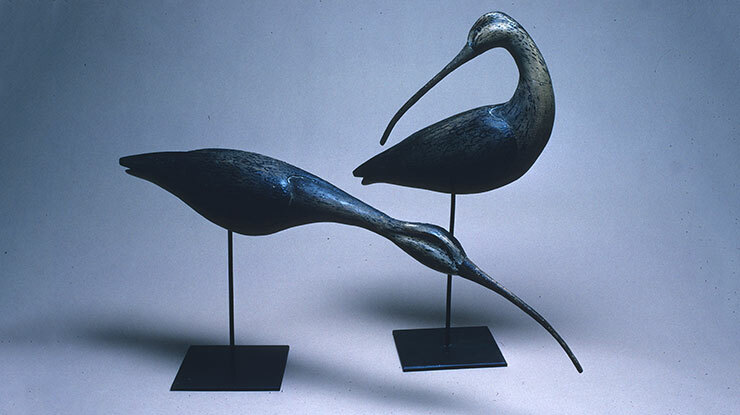 Bob admits that early in his career he used the wheelchair to get noticed and to stand out from the legion of bird carvers who attended the art shows and carving competitions. “It helped people remember me,” he said. 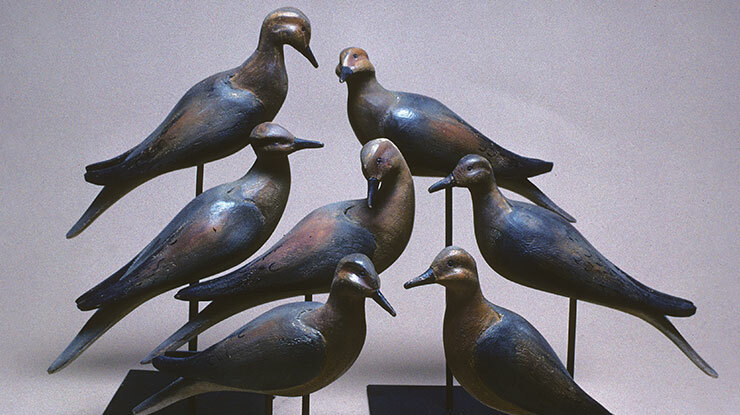 While Bob’s early interest in woodcarving reflects his passion for antique hunting decoys, his work has evolved to cover a wide range of subjects, from the dramatic to the whimsical. 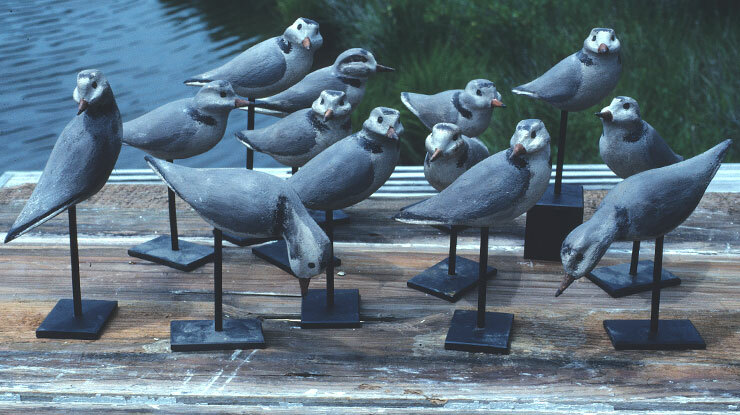 In his studio overlooking Hunting Creek you will see a carving of a peregrine falcon with a dying shorebird in its talons. 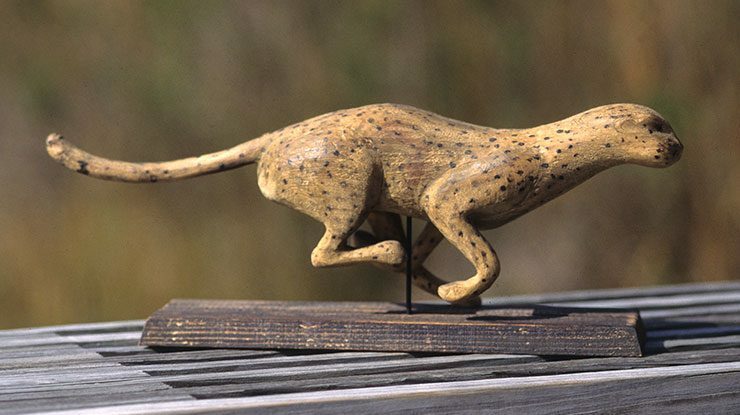 You also will find a carving of a cow jumping over the moon, a carved cat with moving joints sitting on the edge of a shelf, and several carvings of dragons. Bob’s general procedure is to apply paint to an area, burn the paint, and buff it with a bristle brush. He uses Ronan brand oil paints, which are very concentrated, dense paints used in the sign-painting business. 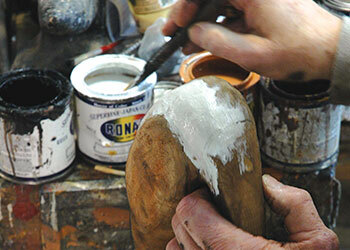 Bob applies the paints with worn brushes, blending the colors on the carving. 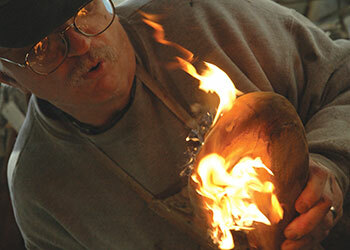 Bob is also very careful to only light the carvings on fire over a concrete floor with no combustibles near it. Use common sense if you use any of his techniques—fire can be very dangerous. Step 1: Apply dirty paint thinner to the carving, and light it on fire. The paint thinner burns away and creates an “instant patina” that will show through thin layers of paint. Step 2: Apply white Ronan paint diluted with mineral spirits. 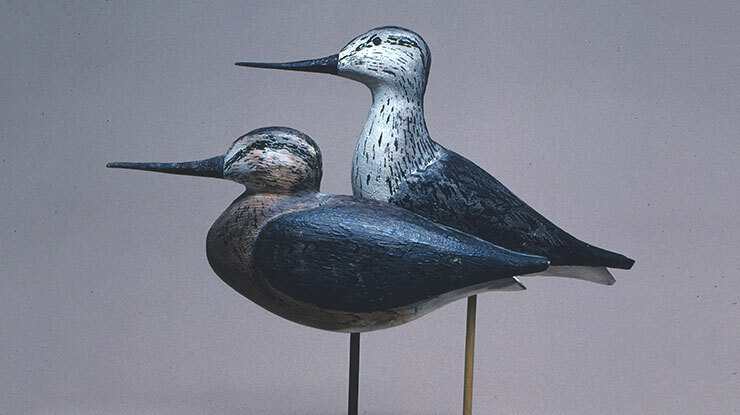 Bob uses thin washes of paint so texture and some wood color can show through. Step 3: Carefully set the paint on fire. When the fire burns out buff the carving with a coarse brush. Step 4: Add raw sienna to the white. Apply this to the face of the bird. Then light this on fire. 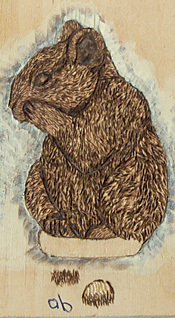 Step 5: Paint the bill with Van Dyke brown mixed with a small amount of raw umber. Add a little raw umber to the mix and paint the sides of the bird. 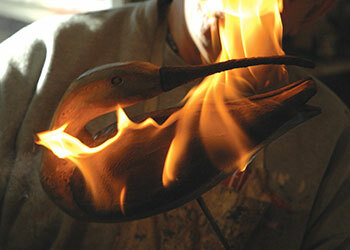 Step 6: Carefully light the bird on fire once you are satisfied with the painting. This gives the carving an aged look. Step 7: Add texture and feather patterns. 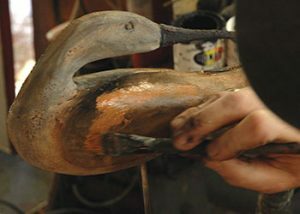 Dab a stick into a can of Van Dyke brown and press the stick onto the bird to create an irregular line. Then tie a small piece of sandpaper around a pencil, creating a U-shape. Dip the sandpaper into the paint and transfer the paint to the bird. Be sure to have the closed end of the “U” to the back. Bob uses thin washes of paint. 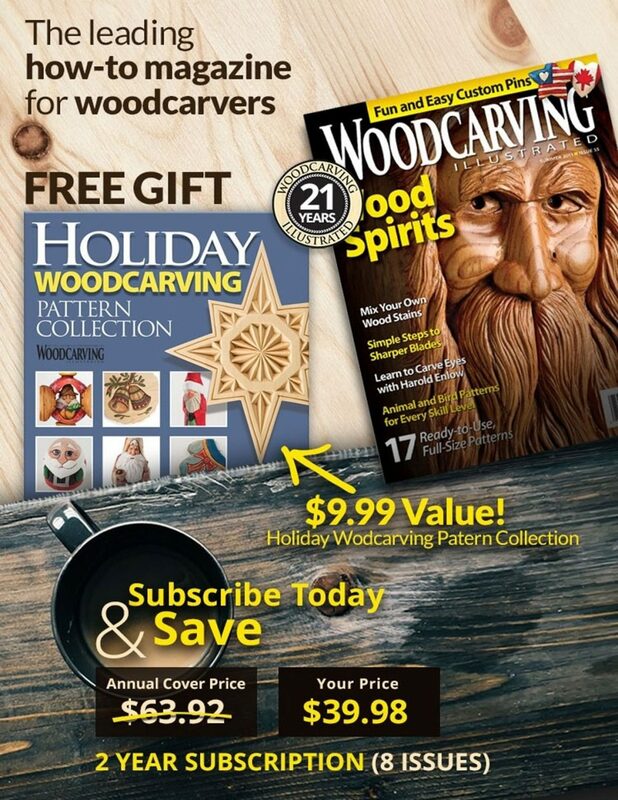 If he gets too much on the carving, he will wipe it off with a cloth dampened with paint thinner. Here you can see that the paint on the wing got too thick. 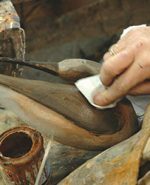 After wiping it with mineral spirits, the paint on the wing is now lighter, with some of the patina and texture of the wood showing through. 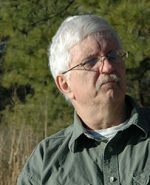 Curtis Badger, a former director of publications for the Ward Museum in Salisbury, Md., has written widely about natural history and wildlife art. 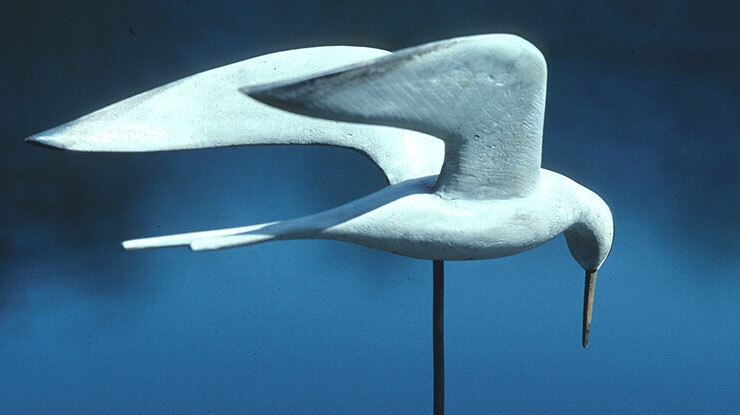 He has done numerous books on bird carving for Stackpole Books, and he recently wrote a book on the natural history of the Atlantic Coast entitled The Wild Coast, published by University of Virginia Press. 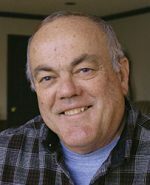 Tom Badger is Curtis’ son.